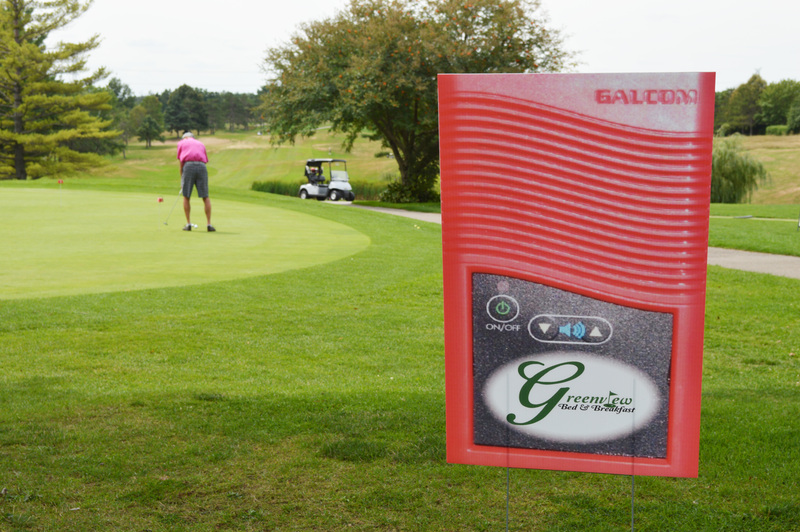 Summer is here again, which means it will soon be time for Galcom International’s Golf Tournament! 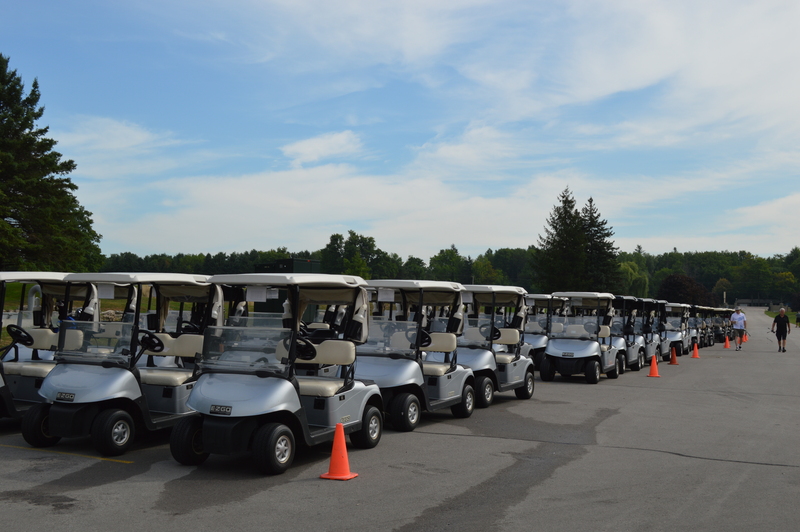 This year, we will be celebrating our ninth annual charity tournament at Flamborough Hills Golf Club on August 21st. Galcom began this golf tournament to raise funds for the radios we send to many people groups needing to hear the Gospel. Galcom’s solar radios provide a link for its listeners to local, national and international news. They are tuned in to the local Christian radio station and can provide information on topics such as health, infant and child care, disaster relief, and the all-important message of God’s love and forgiveness. Galcom’s audio Bibles can be programmed in over 6,000 languages/dialects, they are another durable, solar-powered way of presenting the Gospel. Each year, the golf tournament proves to be a great day of playing golf out on the links, followed by a delicious dinner in the clubhouse, a thought-provoking speaker, and a prize for the participants. If you would like more information about joining us for the day, or if you feel led to donate a prize, please contact our office at 905-574-4626. You can also register online for the golf tournament. We have been looking at children of the Bible the last few months. Timothy is the next child we will discuss, as we draw close to the end of this series. I believe there are some important things we can learn from the life of Timothy, especially as a child, that can encourage our hearts and perhaps help some parents in raising their own children. Timothy, whose name means “honouring God” or “precious to God,” certainly lived up to his name. Timothy came from a special home setting. You know that at an early age he put his faith in the Lord. The Bible says in Acts 16:1 that Paul had come to Lystra where Timothy lived. His mother was a Jewess and a believer in Jesus, and his father was a Greek. Nothing else is said about his father, but in II Timothy 1:5 the Bible says that Paul longed to see Timothy because he noticed in him the same unwavering faith and the sincere trust in God that was first modelled by his grandmother, Lois, and then by his mother, Eunice. Wow, this is a powerful statement. Three generations of solid believers is a testimony to God’s amazing grace, and it is also a testimony to the way Grandmother Lois and Mother Eunice raised Timothy. Let me ask you grandparents: are you passing on the precious truth of Jesus our Saviour to your children, and in turn, encouraging them to pass it on to their children? You can have a mighty impact on their lives just as Eunice and Lois did with Timothy. Eunice and Lois didn’t wait until Timothy was old enough to even understand to teach him God’s Word. They started when he was an infant. When we sing “Jesus Love Me” or “For God so Loved the World” to a babe in arms do we think they really understand those concepts? Or if we read Bible stories or Bible passages to them do we think they really grasp all that we are saying? Of course not! But we are laying a foundation from the very earliest years that shows a respect for God and His Word. We are placing God’s truths and familiar phrases within their young minds that will take on proper meaning as they mature. We are sowing the seed that will eventually take root in the virgin soil of their hearts and grow to bring forth fruit. The fruit doesn’t appear until a plant is mature. The plant doesn’t begin to mature until the seed germinates in the prepared soil. The seed can never germinate if it is never planted. So, you see, Lois and Eunice sowed the seed of God’s Word early in young Timothy’s heart. They watered it with prayer and tilled the ground to make it receptive for the seed to germinate. Then, as he grew, they continued to sow the seed. In Timothy’s life this had a huge impact. From an infant he knew God’s Word, by faith he appropriated God’s grace as taught in His Word, becoming a child of God, and then by faith began to live it out. When children are taught early, when they are led to accept Christ as their personal Saviour early in life, when they are taught the truths of Scripture and how to apply them to their lives, and when they understand that God’s Holy Spirit within them lives out the life of Christ through them, there is no more powerful force for the Great Commission than this! Is this not the world we observe today in North America? Paul encouraged Timothy to be on guard and to recognize that God’s word would be his guide through the hazards of life. And then what did Paul do? He prayed for Timothy constantly. Parents, you want your children to experience God’s best for them. Pray for them continually. Encourage them and affirm them when they do what is right. Set the example. But most of all, pray for them. It is so easy to allow our busyness, our tiredness, our distractions, and our carelessness to keep us from this most important task. Pray that God would keep them in His Word, that they will be able to recognize temptation for what it is, that they will see the consequences of wrongdoing before they allow themselves to be sucked in. Pray for God’s protection around them keeping them from the Evil One, and pray that they will have a hunger to know God better and a desire to serve Him. This is just another example of Galcom International radios touching a person’s life in a positive way for Jesus Christ. Galcom International is the Canadian distributor and assembler of the Megavoice audio Bibles, which were used in this testimony. “Just a few weeks ago 85 members of the Iris Global Asia family gathered in Singapore. Missionaries and nationals from Nepal, India, Philippines, Cambodia, and a few other ‘private’ locations came together to fellowship, worship, and share about their lives and ministries. The gathering was coupled with participation in the Kingdom Invasion conference. Picture taken from The Joshua Project website. The 10/40 window is a common term among Christians. It is a rectangular area between 10 and 40 degrees north of the equator. This area spans from North Africa to East Asia. Billions of people live in this particular area, and it is where most of the unreached people groups reside. It also seems that almost every major non-Christian religion is located in the 10/40 Window, including Islam, Buddhism, Animism, Atheism, and Sikhism. But in “light” of that fact, God’s love reaches into the darkest corners of the 10/40 window and all around the world. What if we could hear God’s heartbeat for the nations? ~The 10/40 Window contains over 70% of the world’s population but only 8% of the world’s missionary efforts (Christian radio can reach these people). ~Most of the people in the 10/40 Window have never met a Christian, seen a Bible, or entered a church (But I am sure most know what a radio is). ~The 10/40 Window is also known as the “resistance belt” and remains the darkest and most inhospitable territory to the cause of Christ and represents the greatest remaining stronghold of Satan (Radio waves are able to cross borders and reach into areas where missionaries are not welcomed). Time is short and the time is now. We have been looking at the stories of children in the Bible and things we can learn from them to apply to our own lives. Perhaps this next story you would not consider as about a child, but a young son reaching adulthood. He was probably in his early twenties, since a Jewish son was considered independent at that time. He had an older brother and a dad. His father was respected in the community, a man of means and integrity. No mention is made of his mother, which is unusual in this situation, so she may already have died. This story, found in Luke 15:11-32, shows the younger son’s understanding that all of his father’s possessions would become the inheritance of he and his brother. He could hardly wait. In fact, he couldn’t wait at all. Was this the first time he had approached his father about the inheritance? Perhaps his brother was a more diligent landowner than he and he realized that when the time came for the property and money to be divided, his brother would be in a better position than he would be. Or maybe he just wanted to get out on his own, do his own thing, be able to make his own decisions, and not always be ordered around by his father. This young man is known as the Prodigal Son. Many of you can relate to the search for independence by those approaching adulthood. Now if you were his dad, what would you say? I suspect this son had been pressuring his father for some time and ignored his father’s nudging to just hang in a little longer, to decide what he really wanted to do with his life, and to work out a plan for using his share wisely. The father knew his son was bent on leaving home and going his own way, so, reluctantly, he divided his inheritance between the two sons. He watched heartbroken as his son packed up his belongings and moved to another country, but the son was lighthearted and almost giddy about his newfound freedom. With lots of money comes lots of friends – the son was too naïve to realize they were only fair-weather friends. He “lived it up” and had the time of his life. The story is as old as time – the money never lasts nearly as long as we anticipate. The friends moved on and in verse 13 it says he “squandered his wealth in wild living.” There was nothing left. To squander means to “spend extravagantly, thoughtlessly or wastefully.” The money was gone, there was nothing left and the son found himself reduced to a lowly servant of a pig farmer. He was so hungry he would have eaten the pig slop and the Bible says, “no one gave him anything.” How sad! Could someone reading this be in the same situation? The passage tells us that as he sat in the pig pen, he came to his senses. He thought of his father’s servants: well-dressed, well-fed, well-housed, content. He thought of himself, the son: destitute, in rags, and starving. He was no longer cocky, demanding and self-assured, but humbled, distressed and a little wiser. This time he formulated a plan. He would go to his father and ask for his forgiveness. He would request a job as a slave, since he realized he was no longer worthy to be called a son. He had shamed his father and brought disgrace upon the family. His was willing to make amends by becoming a servant. He packed up his few belongings and headed home. There was no spring in his step on the return journey, no giddiness. His head was bowed and his bare feet trod the hardened path as he rehearsed over and over what he would say to his disappointed and angry father. With his head down, he didn’t realize that, while he was still a long way off, his father had spotted him. His father was running down the road to meet him. He finally looked up and then ran toward his father. He hardly had time for his rehearsed speech. His father welcomed him home, clothed him, gave him a family ring and prepared a great feast for him. He had been waiting all this time for his son to return – now they would celebrate. I think of a close friend of mine whose son did the same sort of thing. No, he didn’t get an inheritance; instead he stole it from the home and pawned it for whatever he could get – jewellery, money, furnishings, etc. For years his parents grieved and prayed for their wayward son, and one day, the son came to his senses. The father’s love reached out to him and received him back and helped him back on his feet. The son turned his life over to the Lord, and the relationship today is one of joy and blessing. How wonderful to know that God is still in the business of rescuing the strays, restoring relationships, and rebuilding lives. As John 3:16 says, “For God so loved the world, that he gave His one and only son, that whoever believes in Him will not perish but have everlasting life.” If you are like this prodigal son, God is waiting to welcome you home. You only need to trust in Him. And if you are the waiting father or mother, keep on praying and believing. God is still in control. His family encouraged him to go, but those haunting words came to him again,” Someone like you couldn’t do that, who do you think you are?” He had the desire to go on a mission trip, but he lacked the confidence to follow through. John talked with his friends and they encouraged him to follow through and inquire about the mission trip. To his surprise, the idea began to appear as something that just might happen, at least the beginning was doable. Excitement was beginning to rise up inside of him. John began to think that he should have his affairs in order prior to going on this mission trip. He thought a will might be good to have. He remembered that he had met a man who was a lawyer, so he contacted him to write up a will. Several days later, the lawyer called John up and invited him to go kayaking, something he really enjoyed doing. While meeting with this lawyer, the topic came up regarding John thinking about going on a short-term mission team to hand out Galcom’s ImpaX radios. This idea stirred the heart of the lawyer, who wanted to know more details. This, in turn, led to the lawyer desiring to be part of the outreach by writing off one-third the cost of drafting John’s will and instructing him to take this money and use it to buy more radios, or use it in a way that would help with this trip and those in need. God was definitely working out His plan to show John how valuable he is, and that God does care and will do things in our lives that we have never dreamed or imagined. He even opened the heart of the lawyer, as well, to be part of changing lives for eternity in a foreign land. God has now created an avenue for John to follow up on his return to share more exciting events of how God is working in people’s lives. John is quite overwhelmed to think that God would do these things for him. Never in a lifetime had it ever occurred to him that God is so real and desires to bless us as we trust and follow Him. Shouldn’t we all be more confident in trusting God with His plans for our lives?